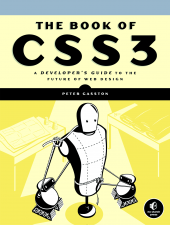 The Book of CSS3: A Developer's Guide to the Future of Web Design by Peter Gasston is from No Starch Press, 2011. This is a professional level book, meant for developers already capable with CSS. Gasston does an effective job of describing all the currently practical and theoretically useful capabilities of CSS 3. He approaches each topic by starting with a high level explanation of the syntax for each CSS 3 property. He then gives a brief but practical code example accompanied by a black and white figure showing the effect of the code snippet. If there are a number of ways the CSS can be used to create different effects, Gasston goes through each one. For examples, he has numerous examples of what can be done with multiple columns and gradients. He lists which browsers (if any) support the property now and which browsers have promised support in the near future. If browser specific prefixes are needed for properties, he specifies which ones. The chapters are arranged in an order that takes the reader from parts of CSS 3 that are immediately useful and dependable to things that are still theoretical and not yet implemented. Here are some of the chapters – I'm leaving out things like introductions and appendices – but you can see the way the information is ordered. There are two appendices. One collects all the browser support data from each individual chapter and property. The other is an excellent set of links for online resources. I read it front to back because I was planning to write this review, but I think this book would be most useful to a developer as a reference. Keep it on a nearby shelf and grab it when you need to check on how to do something or check on what needs a browser prefix or check or the syntax needed to accomplish a particular effect. It's immediately useful, but it will also be there with solid information as some of the not-yet-implemented aspects of CSS 3 come into common use. I can certainly understand the decision by an author and publisher to keep the cost of a book down by going with only black and white, but this book would have benefited from color. I have a trivial complaint that has nothing to do with the quality of the content of the book. The paper used for the cover has some sort of coating that makes it feel greasy. It doesn't actually make your fingers greasy, of course, but I had the urge to wash my hands every time I touched the book. A disconcerting sensation that was distracting to me. Summary: A thorough examination of the present and potential uses of CSS 3.